Discover the festive scent of hand-selected winter berries and rich spices in our Premium Wild Berries Gift Set. Featuring no fewer than four votive candles and a luxury rattan diffuser, the set gives you the option to fill your entire home with the fragrant aroma of winter wild berries – setting a charming and nostalgic tone throughout the festive season and beyond. Warming, soothing and spirit-lifting, we’ve blended our Wild Berries scent to evoke the nostalgia and cosiness of a blustery winter’s night spent beside the hearth. Blackberries, red currants, and sloes are just some of the natural berry extracts we’ve used to create this enchanting festive fragrance, lending a rich, fruity, and invigorating aroma to your home. Seeking to add yet more festive appeal to our wild berries bouquet, we’ve added a range of seasonal spices to complement and refine the fragrance. Nutmeg, cinnamon, ginger, and allspice work to heighten the charm and nostalgia of this memorable fragrance, helping to lift your spirits on even the coldest winter’s evenings. 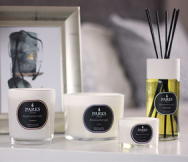 Enveloping your home in warming, mood-lifting fragrance, our Wild Berries fragrance provides aromatic and long-lasting aroma in both natural wax and diffuser form. Each votive candle offers up to eight hours of burn time, while the diffuser provides effective room fragrance for up six weeks – so you can enjoy the rich, warming scent of winter berries across the season. Our Premium Wild Berries Gift Set is wrapped up in a charming gift box, making it the perfect gift for a loved one this winter.